incess would emerge and I wouldn’t be able to hack the conditions. Crossing the border was the first sign of Bolivia’s uniqueness. 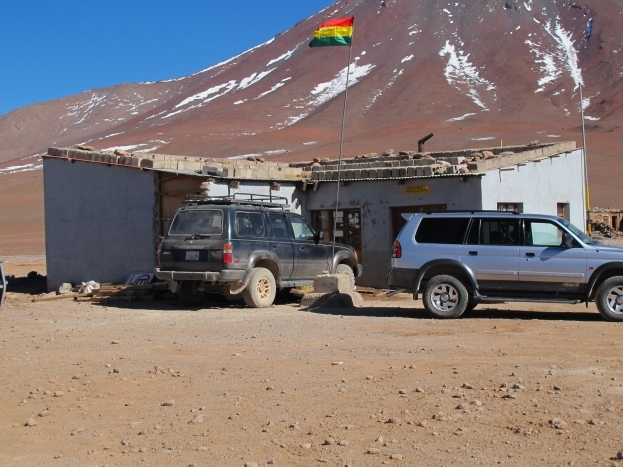 Forget high-tech finger printing and face recognition (a la the US), the Bolivian border consisted of a small shed in the middle of nowhere and a friendly agent happily stamping everyone’s passports. 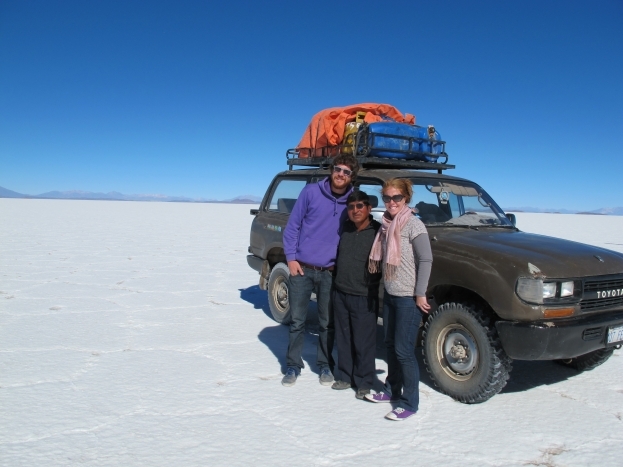 With the paperwork out of the way, we were introduced to our guide Saturnino and our four travelling companions and climbed aboard the Landcruiser that would transport us all over the Bolivian desert. Saturnino didn’t speak a word of English, but thankfully Claudia and Alverto from Costa Rica happily translated everything he said. When I hear the word “desert”, I think baron landscape without a drop of water. 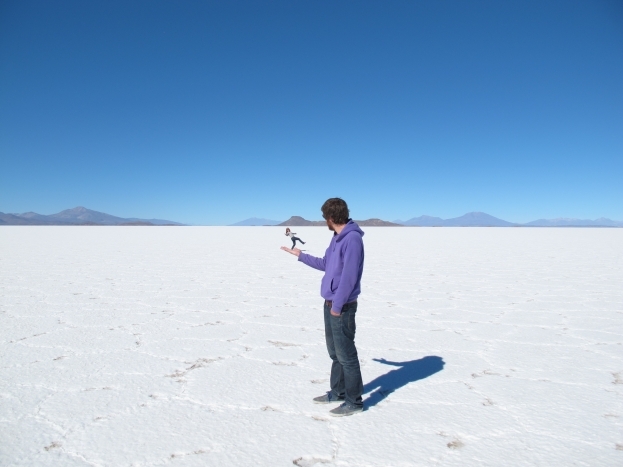 Things are a bit different in Bolivia. 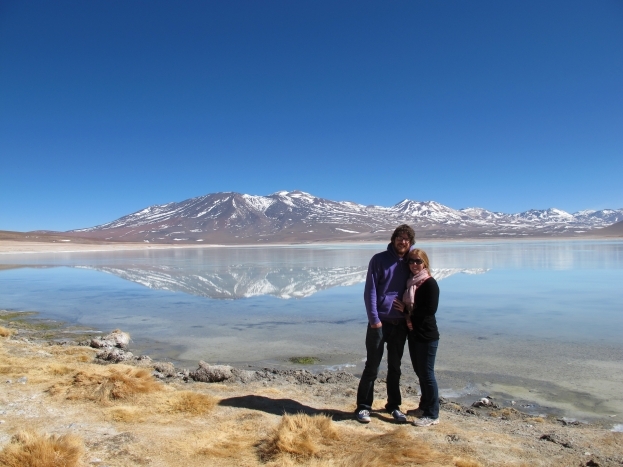 Within an hour of our adventure, we arrived at Laguna Blanca (White Lagoon). After taking more than enough happy snaps, we jumped back in the car to head to the Polques Hot Spring for a delicious dip. 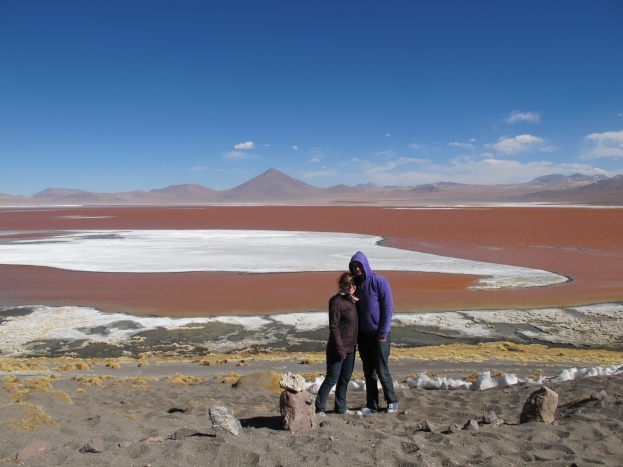 Our first night was spent at the Huallajara refuge, which overlooks the brilliant red Laguna Colorada. Satornino estimated it got down to -10 that night, and we sure felt it. The basic buildings certainly weren’t insulated and Joel and I were grateful to use the thermal sleeping bags we’ve been lugging around for three months. 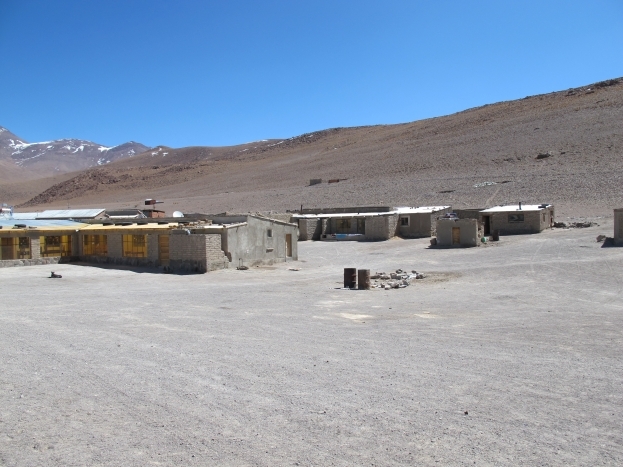 The refuge was located about 4300m above sea level, and we all suffered splitting headaches during the night, thanks to the lack of oxygen. After hitting the road on day two, most of us tried to catch up on the lost sleep from the previous evening. 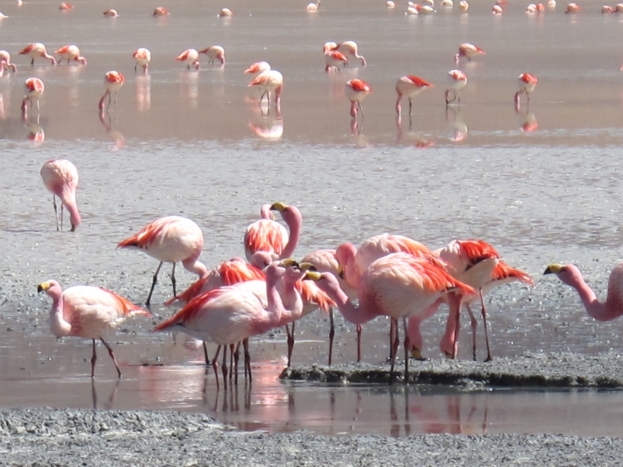 We quickly woke up when we arrived at the Stinky Lagoon, which was full of pink flamingoes. They’re cute in real life as they are in cartoons and we spent ages watching them dig in the water. 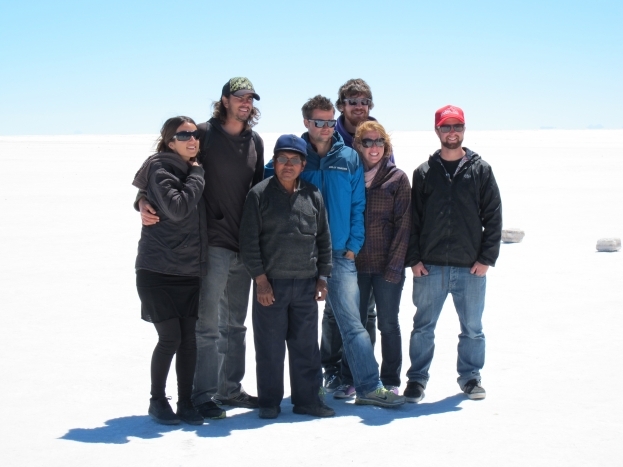 Our second night was spent in the tiny community of Santiago de Agencha, which is located at a lower altitude (approx. 3700m above sea level), making for a warmer night and no altitude sickness. The adorable cabins we slept in featured rock salt floors and furniture, which was a novel way to spend the night before we got to the famous Uyuni Salt Flat. 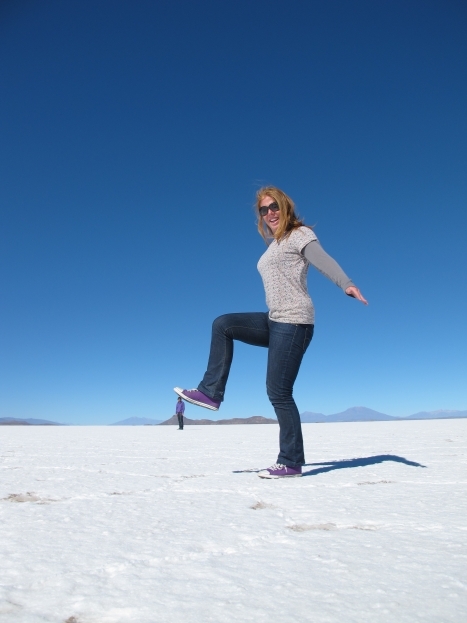 The famous Uyuni salt flat is the very reason most people sign up for the tour. Nothing could prepare us for the magnificent natural wonder made of salt left from an ancient lake that covers 12,000 sq/km like a blanket of snow. It’s up to 80m thick and gets bigger each year, thanks to the annual wet season downpours that make it spread. It stretched as far as the eye could see and without any tracks, Santorini just sped straight over the top of it. Not only does it make for beautiful scenery, but it’s an excellent spot for a few funny pics. 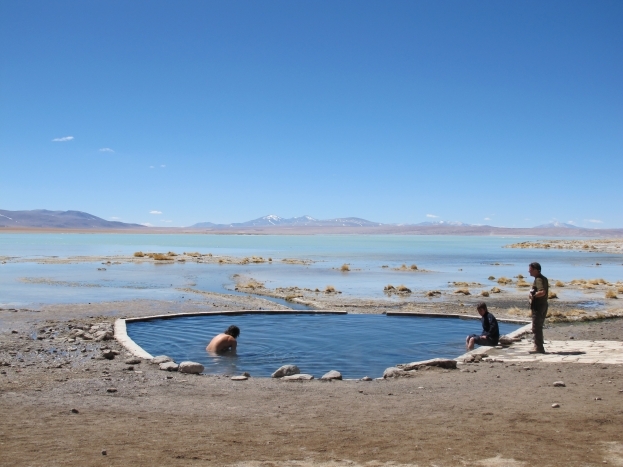 If Bolivia isn’t already on your bucket list, you better add it quick.